Head of Dept of Medical Oncology, Director of the Postgraduate School of Medical Oncology, Director of “Genetic Cancer” Center, Deputy Director of Department of Clinical and Molecular Science, Università Politecnica delle Marche, Azienda Ospedaliero-Universitaria, Ospedali Riuniti Umberto I - GM Lancisi - G Salesi, Via Conca 71, 60126 Ancona, Italy. 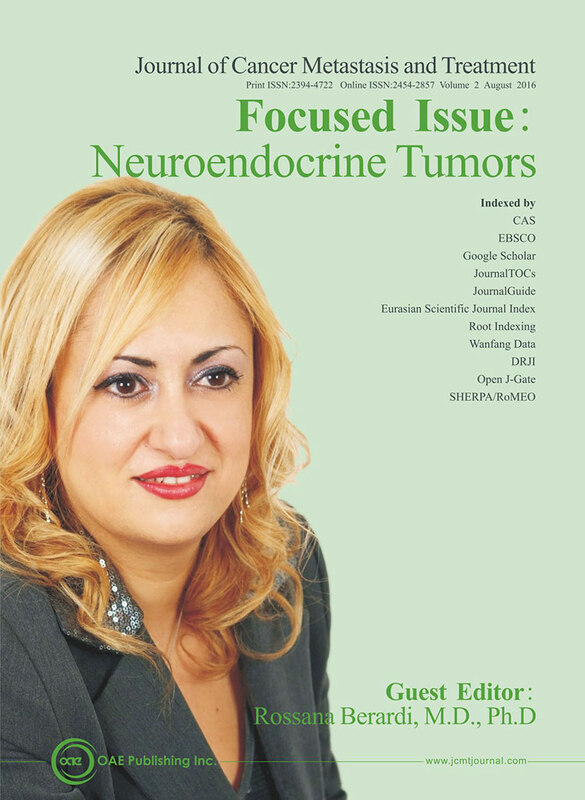 This special issue on neuroendocrine neoplasms aims to summarize the present knowledge about the treatment of these tumors highlighting available evidences as well as new biological perspectives on biological and targeted therapies, also including case reports. Neuroendocrine neoplasms (NENs) are a heterogeneous group of rare tumours often producing high levels of hormones and causing symptoms. There are a number of different types of NENs. They usually arise as advanced and low/intermediate grade only in a minority of cases, as high grade. Treatment depends on which type and may include surgery, interventional radiology, and systemic treatment, including chemotherapy, somatostatin analogs, interferon α2b, peptide receptor radionuclide therapy, and only for pancreatic neuroendocrine tumors, molecular targeted agents, including everolimus and sunitinib. The aim of the article is to review the medical approaches with somatostatin analogs and chemotherapy. The treatment of NENs is mainly based on their biological characteristics of aggressiveness and functional features, such as symptoms and endocrine markers. J Cancer Metastasis Treat 2016;2:313-20. Neuroendocrine neoplasms (NETs) are rare tumors that are increasing in incidence. NETs are characterized by heterogeneous biological behaviour, clinical presentation and course. A sensitive and specific diagnostic and prognostic circulating biomarker useful for all sites, grading and staging of neuroendocrine tumors is still an unmet need. The aim of this article was to review current neuroendocrine and oncologic scientific society guidelines and position statements, and propose recommendations for the most frequent clinical practice queries on circulating neuroendocrine tumors biomarkers. The authors searched for NCCN, NANETS, ESMO, ENETS, UKINETS, AME management guidelines or position statements available from PubMed up to 7th January 2016. From these results we chose guidelines or position statements published by scientific societies or institutions in USA, Europe and Italy with recognized expertise in neuroendocrine tumor patient management. The authors present suggestions for clinical practice based on this analysis. J Cancer Metastasis Treat 2016;2:348-56. Neuroendocrine tumors are rare neoplasms arising primarily in the gastrointestinal tract and lung. The liver is the most common site of metastases, but these tumors can rarely metastasize to atypical sites. Surgery is the only curative approach while the optimal medical treatment is debated. From this perspective, a multidisciplinary approach for each single case becomes very important. 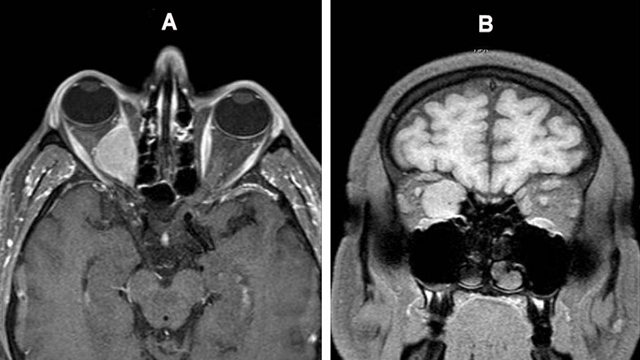 In this report we describe the case of a male affected by a single intraorbital metastasis from a midgut well differentiated neuroendocrine tumor. The patient refused surgical removal and therefore he was at first treated with stereotactic radiotherapy and systemic treatment with a somatostatin analog (SSA). After achieving a stable disease for four months he underwent primary tumor resection. Six years after the initial diagnosis, the patient is currently stable and receiving SSA at standard dose. J Cancer Metastasis Treat 2016;2:341-4. Pancreatic neuroendocrine tumors (pNETs) can be associated with different clinical syndromes. Insulinoma is the most common functioning pNET characterized by hypoglycemia and hyperinsulinemia. The authors report a case of a man presenting with hypoglycemia and biochemical features of insulinoma. A pancreatic lesion was found and growth hormone (GH) deficiency was also diagnosed associated with an empty sella present on the pituitary magnetic resonance imaging. 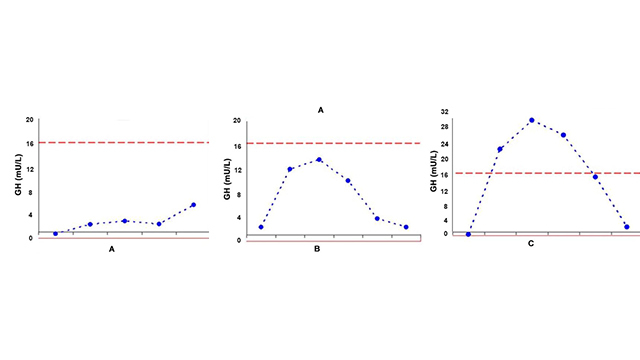 The disappearance of hypoglycemia and normalization of GH secretion after surgical resection of the pancreatic lesion, revealed a rare pNET secreting insulin-like growth factor II. J Cancer Metastasis Treat 2016;2:345-7. Neuroendocrine tumors (NETs) represent a spectrum of rare neoplasms arising in different organism sites. Depending on the site of onset, they also can be distinguished using lab exams (secreting vs. nonsecreting), clinical symptoms (functioning vs. nonfunctioning), behavioral, morphological characteristics (tumor cells’ architectural growth patterns, mitotic and Ki-67 index, presence of necrosis), and grade of cellular differentiation. The aim of this review is to focus on the main signaling pathways targeted by medical treatments of advanced sporadic gastro-entero-pancreatic (GEP) and bronchopulmonary (BP) neuroendocrine neoplasms. The scientific literature regarding treatment of advanced GEP and BP-NETs has been extensively reviewed using MEDLINE and PubMed databases, selecting principal and more recent research articles, clinical trials, and updated guidelines. 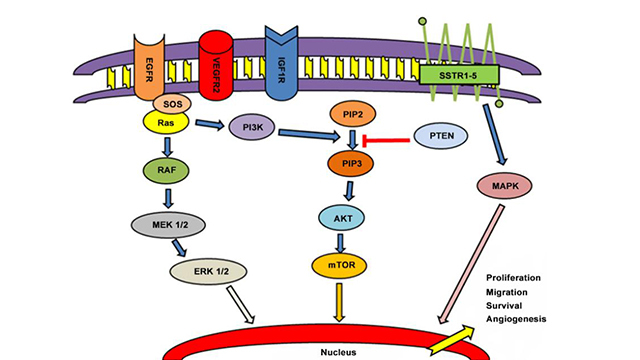 Somatostatin analogues represent a valid approach to control symptoms in functioning tumors and to inhibit tumor progression in certain categories on the basis of the typical somatostatin receptor expression observed in NETs. The pathogenesis of NETs has been the subject of increased interest in recent years. Many driver mutations pathway genes have been identified as important factors in the carcinogenesis process and, therefore, as potential targets for new anticancer therapies. Activating mutations have been shown in epidermal growth factor receptor, stem cell factor receptor, platelet-derived growth factor receptor, vascular endothelial growth factor, basic-fibroblastic growth factor, transforming growth factor, insulin-like growth factor-1, and their receptors. Effective M-Tor inhibition pathway modulation has led to the approval of drugs in this field such as everolimus. New drugs and several combination regimens with targeted and newer biological agents are being developed and tested in recently conducted and ongoing trials. J Cancer Metastasis Treat 2016;2:329-40. Double tracer PET/CT: what is it and what does it mean? 68Ga-DOTA-peptide PET/CT is a recommended imaging modality in the workup of neuroendocrine neoplasms (NENs), which shows high diagnostic sensitivity and is a strong predictor of successful somatostatin receptor directed treatments. Although not routinely recommended, reliable evidences show that 18F-FDG PET/CT can provide complementary information in this setting with the ability to discriminate slow-proliferating tumors from aggressive, rapidly-proliferating tumors. Further, it has been proposed as an independent prognostic factor for the prediction of either overall survival or progression free survival. In this review, we provide insight into the biologic significance of 68Ga-DOTA-peptides and 18F-FDG uptake, and of the use of double tracer (68Ga-DOTA-peptides plus 18F-FDG) PET/CT in the clinical evaluation of patients affected by NENs. J Cancer Metastasis Treat 2016;2:321-8. Neuroendocrine tumors (NETs) encompass a broad spectrum of malignancies all derived from neuroendocrine cell lineage, affecting many different organs including the gastrointestinal (GI) tract, the endocrine pancreas, the thyroid, the skin and the respiratory tract. These tumors as a group are very heterogeneous, with varying characteristics attributed to each tissue of origin and tumor subtype. The pathogenesis of the different subtypes of NETs is not fully understood, but recent studies suggest the Notch signaling pathway may be dysregulated in these tumors either by under or overexpression of Notch receptors and/or ligands, or by disruption of pathway functionality through other means. Notch receptors can function as tumor suppressors in some cellular contexts and oncogenes in others which may, in part, account for the wide range of phenotypes present in NETs. Cancer stem cells are present in these tumors and may be responsible for the high rate of chemotherapy resistance, recurrence and metastasis. The heterogeneity of NETs suggests that to fully understand the role of Notch signaling and the therapeutic implications thereof, a comprehensive and systematic analysis of Notch expression and function across all NET subtypes is required. Here we outline the current knowledge base with respect to current therapies and Notch signaling in neuroendocrine tumors of the lung, skin, thyroid, GI tract and endocrine pancreas. J Cancer Metastasis Treat 2016;2:279-93. In neuroendocrine tumors (NETs), liver metastases (LM) represent the most crucial prognostic factor, irrespective of the primary tumor site. At diagnosis, about 65-95% of gastroenteropancreatic neuroendocrine tumors (GEP-NETs) show hepatic metastasis. Management strategies of LM are heterogeneous and range from systemic therapy to liver-directed procedures. The type of systemic therapy used is dependent on the grade and proliferation of the tumor and includes somatostatin analogues, interferon, m-Tor and tyrosine kinase inhibitors, and chemotherapy. Angiographic liver-directed techniques, such as transarterial embolization/chemoembolization and selective internal radiation therapy, offer excellent palliation for patients with liver-predominant disease. In highly selected cases, liver transplantation and peptide receptor radionuclide therapy are considered. The relatively low disease incidence and the diversity of presentation have led to a lack of well-conducted randomized controlled trials comparing the efficacy of different treatment options. Experience indicates that surgery is the only treatment that offers potential for cure. For unresectable lesions, the absence of data from rigorous trials limits the validity of many publications that detail management. In this review we will discuss the existing approaches for hepatic metastases from GEP-NETs. J Cancer Metastasis Treat 2016;2:294-303. Gastroenteropancreatic neuroendocrine tumors (NETs) have an incidence of 2.39 per 100,000 inhabitants per year, and a prevalence of 35 cases per 100,000 inhabitants; the gap between these rates is due to the relatively long survival time of these tumors, which can be thus considered as chronic oncological diseases. Recently, more therapeutic options have become available, but criteria for defining timing, priority and sequence of different therapeutic options are still debated. This review offers an overview of pancreatic and small bowel NETs, critically underlining the issues that still need to be clarified and some controversial issues on the therapeutic approach for NET patients. J Cancer Metastasis Treat 2016;2:304-9. Merkel cell carcinoma (MCC), first described in 1972, is an aggressive primary cutaneous carcinoma able to incorporate both epithelial and neuroendocrine features. MCC mainly appears in individuals in their eighth decade and it is related to a high mortality rate. The etiology of this rare disease is not well-understood but ultraviolet radiation exposure, immune suppression, and aging have a consistent role in its pathogenesis. Usually, clinical lesions appear as asymptomatic coloured dermal nodules. The tumour can involve lymph nodes but further evaluation with imaging is recommended. The common approach for localized disease is surgical. 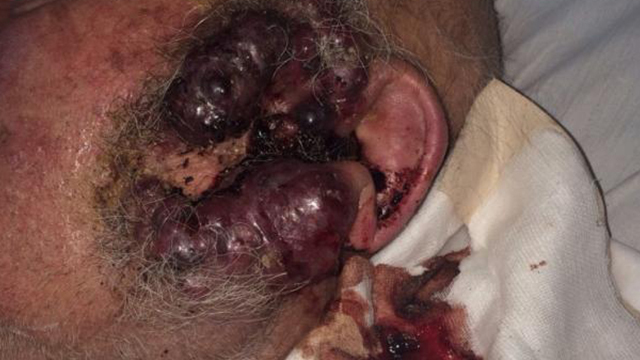 This work reports a case of an 86-year-old man with locally advanced MCC where, based on clinical experience, oral mono-chemotherapy with single-agent etoposide was chosen as first-line therapy. A complete objective response was achieved in 2 months. J Cancer Metastasis Treat 2016;2:310-2. J Cancer Metastasis Treat 2016;2:277-8.